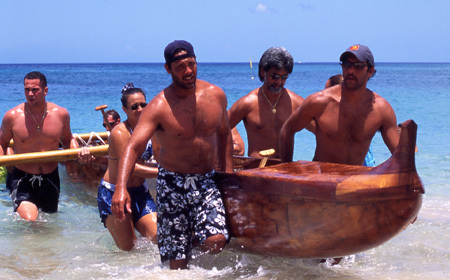 Beginning with the annual Beachboys event, Anuenue crews participated in the majority of the preseason ironman events. In particular, Nappy’s GM crew was often seen in the red, white, and blue Striker on loan from Keahiakahoe. Naturally other crews were expected to stop paddling and salute when the RW & B passed. This year’s OC1 season saw some big days for Aaron Napoleon including teaming up with Kai Bartlett for a win in the Moloka’i relay (Polaris Rules!). 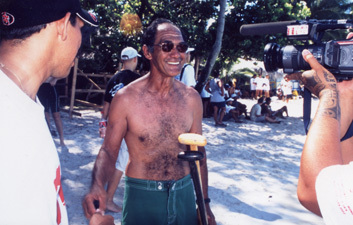 Other notable performances were Nappy’s age group first in the solo Moloka’i race, and Nappy and Gaylord Wilcox teaming up (age group third) for the relay event. 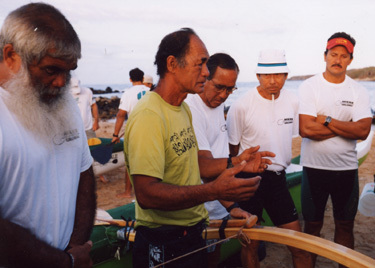 Other regulars on the Kanaka Ikaika circuit were Mike Hangai, Robi and Max Solmssen, Norm Bradley, Mike Silva and Pete Caldwell. 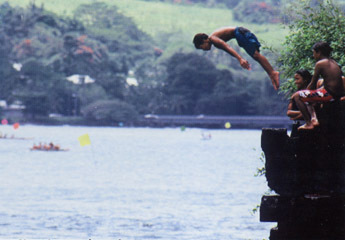 -Kaua’i OC1 individual and Relay events: Aaron, Nappy and Gaylord carried the colors and did well. Joining the Hawaii contingent were Nappy, Gaylord, Ash DeLima and Dr. Pete. Among some big Hawaii team wins was a gold medal in the 1000 M event for the 50 and over Hommes crew steered by Nappy. -Hamilton Cup: Nappy, Anona, Gaylord, and a 45 and over crew enjoyed the hospiality down under and raced in both individual and OC6 events. 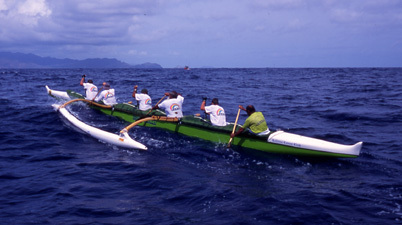 Led by the keikis, Anuenue was a solid second in the A division in each of the first four regattas. The freshmen men and GM men were turning in consitently solid performances while the GM women were improving with each race. The annual Macfarlane Fourth of July races produced some more excitement, and the Oahu chanpionships saw five crews qualify for States in Hilo. In a controversial call, the keikis were hit with a DQ spoiling a strong second place finish: yet the trip was a blast for all the young paddlers. For the adults, they got to weather a traditional Hilo deluge but still placed well in GM men and women, and mixed 55 events. 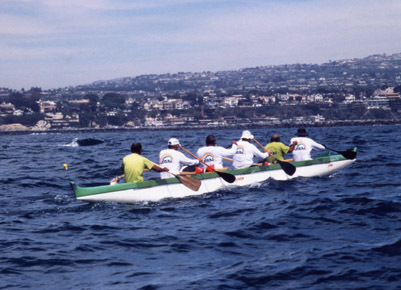 Two crews represented Anuenue in the 24th Na Wahine race with an open crew coached by Kawika Napoleon plus a combo crew with Anona and some GM paddlers joining forces with friends from Santa Cruz. Nappy (#45 and counting) in mid-channel on the way to division third. Behind winner Ra’i from Tahiti, the open crew had a strong fifteenth (5:40:56) in spite of an unexpected flip.